Muslim Aid’s Community Liaison Officer Mr M Walayat Khokhar attended an Iftar Event on Tuesday 17th August at Waltham Forest Assembly Hall. 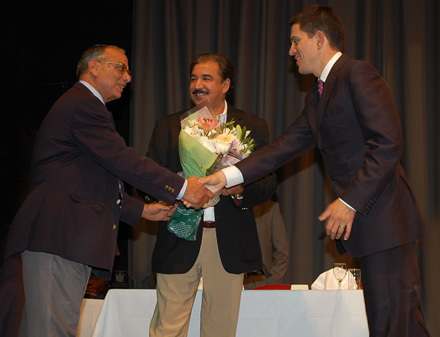 Chief guests Rt Hon David Miliband MP and Lord Nazir joined local councillors, guests from the Pakistan High Commission, community leaders and other dignitaries. Mr Khokhar spoke about the current emergency in Pakistan and highlighted the plight of the Pakistan people who continue to suffer due to the disastrous floods. Mr Khokhar expressed his sincere gratitude to all donors who have to date, raised over £2million for the flood affected people. Muslim Aid has already deployed 6 teams consisting of public health engineers and health officers in some of the worst affected areas of Nowshera, Charsadda, Jampur, Sukkur (Sindh province) and Multan since launching its appeal on 30th July 2010. “The response from the audience on the night was very encouraging. A substantial amount was collected for Muslim Aid with many, including Mr Miliband, contributing towards the relief work” said Mr Khokhar.